The announcement by Algeria's army chief is symbolically significant. 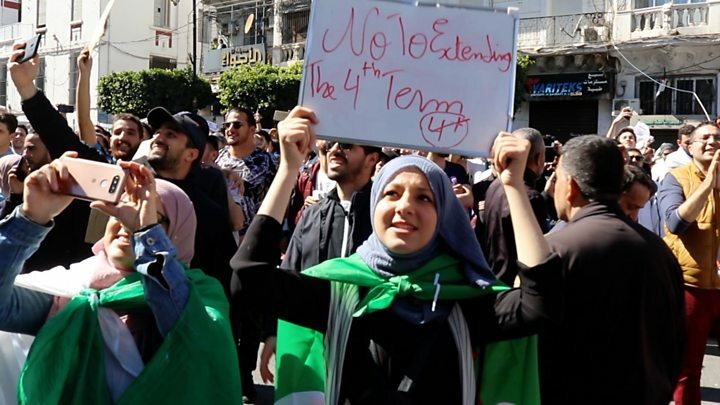 However, given the reality of President Bouteflika's health status, the constitutional impasse over an extension to his current mandate until elections are held, and the rallying calls by protestors who remain on Algeria's streets, the move is hardly unexpected. Still, there will be questions over the army's chief's motivations. In recent years, it is the president's circle of political and army loyalists who appear to have spoken on his behalf as his absence peaked due to illness. 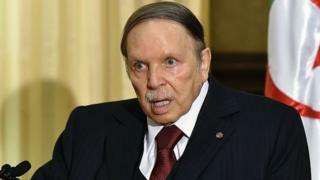 Lt Gen Ahmad Gaed Salah is viewed as fiercely loyal to Mr Bouteflika and a central "pillar" to the ruling powers of Algeria - so much so that on the weekend, a privately-owned local newspaper reported that he "must go" along with the president. The country's Constitutional Council will need to back this latest call, and then ultimately it will be left to the parliament to officially decide the president's political fate. Media captionHalf of Algeria’s population is under the age of 30. He does not travel around the country or abroad, except for medical treatment. The Constitutional Council must first agree to trigger Article 102 of the constitution. Both chambers of parliament would then meet in a joint session and vote on whether the president is unfit to perform his duties. A two-thirds majority is required. If this passes, the speaker of the upper house of parliament, the Council of the Nation, would take over the duties of the president. The new provisional head of state would rule for 45 days with a specific mission to prepare for new presidential elections. The provisional president cannot stand in those elections.